BML official awarding the token of achievement to the winners. PHOTO: BANK OF MALDIVES (BML). 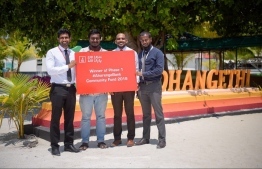 Bank of Maldives (BML)’s Aharenge Bank Community Fund, which was inaugurated to provide aid for sustainable projects undertaken by individuals and non-profit organisations in islands, selected the five best proposals on Sunday. Naifaru Juvenile - to build a shaded area for the public near the docks in Naifaru, Lhaviyani Atoll. Ibrahim Farshan - to provide every house in Dhangethi, Alif Dhaalu Atoll, with eco-friendly bags in order to reduce single-use plastics. TFM Sports Club - to build a shaded waiting area near the school of Dhiggaru, Meemu Atoll, for parents and students. Nashid Adam Naseer - to construct a library in Maaenboodhoo School, Dhaalu Atoll. BML held a ceremony at Dhangethi on Sunday to announce the five projects. Ibrahim Farshan, who proposed the reduction of single-use plastics, won a symbolic token during the ceremony. “BML invested MVR 300 million in the last year as part of contributing to society from bank profits. Financial aid was extended to 110 community projects that were underway to benefit the entirety of Maldives. With the inauguration of the fund, our ongoing work will increase in fostering the development of society by financially supporting projects in every corner of Maldives. Our hope is that individuals and organisations submit great proposals in the second quarter as well”, said a BML official. The opportunity to submit proposals for activities targeting society for the Aharenge Bank Community Fund will be opened late April. All proposals must be non-profit work relating to education, sporting activities or preservation of the environment. The five proposals selected as the best for each quarter of the year would receive financial aid of MVR 50,000 to run its activities.